Darien’s Justin Van de Graaf (17) makes the force out in the fifth inning after taking the toss from Henry Williams against NFA on April 5. NFA was bringing its ace in UConn-bound Tyler Briggs to pitch against Darien. The star pitcher was solid, allowing no runs on just two hits but when he came out to start the fifth, Darien was able to put up the one run it would need to win. That win over NFA was the first of five-straight victories for the Blue Wave, three of which have been shutouts, moving them to 5-1 on the season. 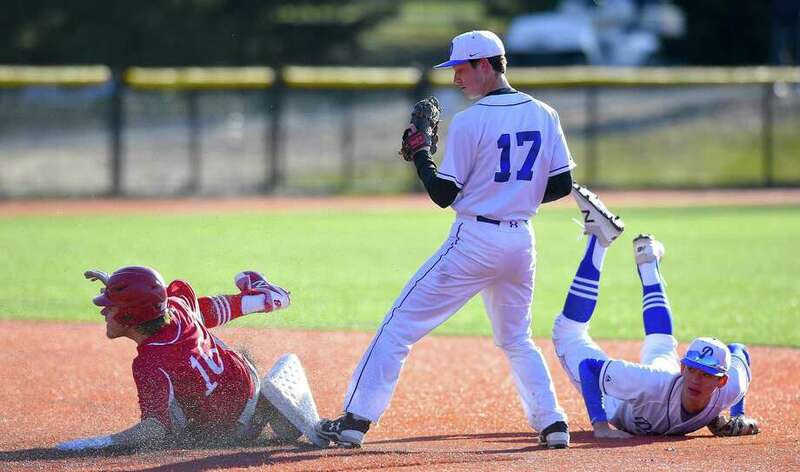 While Darien pitchers Justin Jordan and Henry Williams may not have come in with the same pedigree of Briggs, it was the two Blue Wave hurlers allowing just one hit while striking out a combined nine batters in that game. It perfectly summed up every Blue Wave team in recent seasons. No superstars, no elite prospects but rather a bunch of players dedicated to doing their jobs and pitchers intent on throwing strikes. Jordan and Williams are joined in the rotation by Jackson Vaught and Justin Van de Graf with a plethora of bullpen arms as well. The depth at pitching has been a staple of Darien’s success on the diamond. The run that they scratched out in the fifth against NFA was evidence of how the offense can get just enough for the pitchers to thrive. Back-to-back walks followed by a well-executed sacrifice bunt set the stage for Williams who put together a quality at bat before singling to right field, driving in the only run. The team can also pound the ball and is heating up even before the weather does. If Darien is playing this well before they “peak,” what lies ahead for their opponents could be scary. The team-first approach has the Darien baseball program here to stay. In a town that is rightfully known for its lacrosse team that dominated the state for the last 20 years, the baseball team under Scott has become perennial contenders for the FCIAC baseball crown. This season is no different and the recipe for success is no secret. Pitching, defense and clutch hitting. With Jordan batting leadoff, the Blue Wave have a speedy table setter with a penchant for getting on base. When Jordan is not pitching, he is patrolling centerfield as a top defensive outfielder. With Jordan in center, Van de Graf and Williams have the middle infield secured when they are not pitching. Williams has been the most consistent hitter thus far but the strength of the team lies in different players stepping up every game. If the middle of the order lacked some pop early on, that changed when DH Sean O’Malley returned from a hamstring injury this week. O’Malley was an All-FCIAC player a year ago and is one of the best power hitters in the state. His return has helped extend the lineup and let fellow heart-of-the-order slugger, first baseman Harry Rayhill, do some damage. Rayhill has provided some power in the middle of the order, including a home run against Greenwich Monday. The last piece, and often the most overlooked, is Darien’s ability to put quality catchers behind the plate. This season, that is Arthur Xanthos who follows in a long line of solid defensive backstops for the Wave. Since winning the FCIAC championship in 2016, that has become the standard to reach every season. The next goal after that would be the team’s first trip to a state championship game. That is not an unrealistic idea in Darien anymore. This is a disappointing article. Justin Jordan’s pedigree is as good or better than anybody in the FCIAC. He is a dual threat as a LHP and an OF. He is a three year varsity starter, was All-FCIAC his sophomore year, and accrued numerous accolades in the recruiting systems since the age of 13. Prep Baseball places Justin as one of the top OF in New England. He’s had interest from multiple D1 schools and is going to SHU. Oh, and he also beat the “ace” from NFA. Your reporting lacks credibility when you don’t do your research and write that Darien has no stars. Hmm not to point out the obvious but the pitcher from NFA did come out of the game allowing 2 hits and liz ” no runs”. Oh news flash..great team win… Congrats to your son playing at SHU. A good program and I mean no disrespect when I say they are not Texas, UNC or Duke. Again great win for the Dariem TEAM. Nor is UCONN. Justin is not my son. Yes, it was a good team win for Darien, just as NFA wins are team wins, not Tyler Briggs wins. You missed the point, which was that to laud one kid’s “pedigree” over others, when other kids also have great accomplishments, is poor journalism. It’s not about the game or the wins. It’s the lack of research and shoddy writing that are the issue.